This book is for every writer who has ever struggled with the question of what to write next. Here are some of the tips she offers in the book. A lot of writing can stem from a single question. But we need to allow ourselves the time to really contemplate the question. In this book, Jaden breaks down her philosophy into the S.P.A.R.K. acronym. This part of the equation really reminds me on my personal writing philosophy of T.L.C.W. What a great idea. There is already a lot of drama going on in social media. It could be a rich treasure trove of ideas, if used properly. Just make sure you don’t write about the people specifically. Take ideas and transform them into original stories with different characters and you could have a winner. Writing can give you the power to say something you wouldn’t normally say. Take advantage of that. I like this analogy. We should always be able to write. Fear might be an obstacle, but it is one that we can overcome. It’s like pain to a runner. You can push through it. You can write through it. 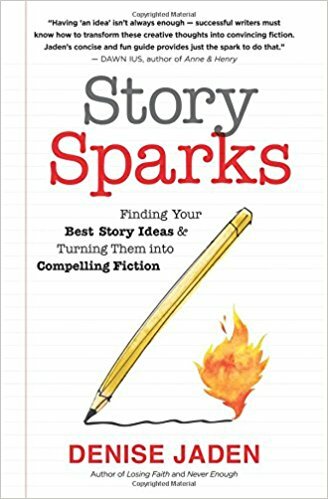 At the end of the book, Jaden provides several lists that can help you come up with character names, places to set your scenes in, motives for character behaviour, obstacles for characters to overcome, and story themes you can weave. It’s a great book with practical exercises, advice, and tips for writers who need to find some inspiration. Also, if you liked this book, you can also look for her other book on writing, Fast Fiction, that is perfect for anyone attempting National Novel Writing Month challenge right now.